The Groves in Temecula Wine Country offers an exceptional opportunity for the motivated buyer seeking luxury living in an ideal location that offers country charm, majestic beauty and metropolitan conveniences. TEMECULA, CA, February 24, 2018 /24-7PressRelease/ — The final homes and four buildable lots are now being offered for sale at The Groves, an amazing view-oriented community located in the heart of Temecula Wine Country. There are four completed homes available as well as four buildable lots for sale within this exclusive enclave that includes just 37 luxury homes. Pricing starts at $1.3 million for select plans with the models priced in the high $1 millions. The Groves presents stately one and two- story residences with a range of approximately 4,096 to 5,287 square feet, up to six bedrooms, six and one-half baths and four to six-car garages. Unique to each plan is an interior casita area with its own private bath and courtyard entry perfect for multi-generational living, a home office, or hobby studio. Modern gourmet kitchens are designed to impress with striking maple cabinets, designer granite countertops with a six-inch backsplash and a large granite-covered island with sink. Appliance packages include KitchenAid stainless steel 48″ professional series cooktop, a double oven, 27″ built-in microwave and an EnergyStar rated multi-cycle dishwasher. The Residence 1 Model Home, priced at $1,774,000, has approximately 4,096 square feet, four bedrooms, four and one-half baths, a welcoming courtyard entry and four-space garage with workshop. The Plan 2 model home has approximately 4,680 square feet, five bedrooms, four and one-half baths, outdoor living area, library/optional office and four-space garage with workspace. This luxurious home lives as a single-story home with a second-floor game and is priced at $1,846,000. The available Residence Three homes have approximately 5,287 square feet, six bedrooms, separate two-space and three-space garages and space-enhancing bi-fold doors gracefully open to the outdoor living area. Other features include a master bedroom sitting room, central courtyard and second floor game room. With sweeping views of the majestic San Jacinto Mountains, The Groves offers the ideal location, just minutes from Temecula shopping and only an hour’s drive to San Diego, Orange County or the Palm Springs area. Surrounded by vineyards and their tasting rooms, the area also offers an array of art, culture, festivals and theatre productions. For outdoor enthusiasts, there are more than 90 miles of bicycle trails throughout the Temecula Valley as well as hiking and exploring at the Santa Rosa Plateau Ecological Reserve, fishing at Vail Lake Resort, horseback riding and several impressive golf courses. The community is served by the Temecula Valley Unified School District. Visit www.flemingcommunities.com or call (760) 822-0831 for more information or to schedule a tour of The Groves. 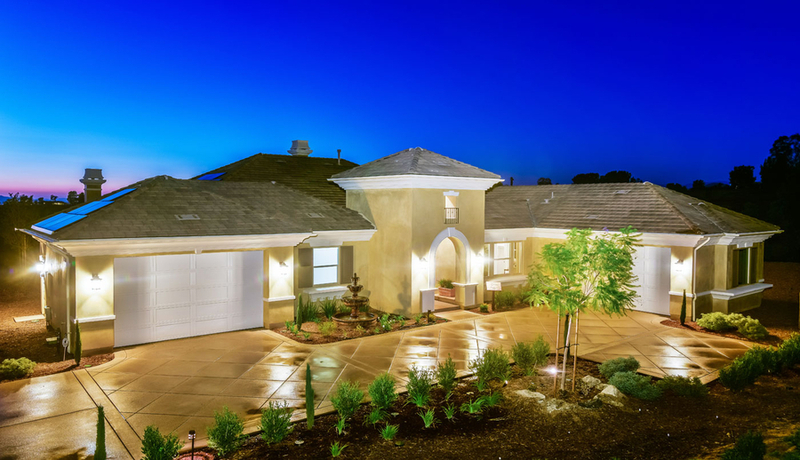 The Groves is located at 41774 Knoll Vista Lane, Temecula, CA 92592. Fleming Communities is a premiere boutique builder, creating communities in Southern California. The Fleming Family has been building homes for generations in the west and now primarily focuses their development in specific areas of California that offer the most scenic topography. Each new home collection created by Fleming Communities offers unique attributes, but the hallmark features of their success are timeless design and enduring quality. Embracing new technology for environmentally responsible designs, Fleming Communities is also noted for offering sophisticated homes and a sanctuary for good living.